COPENHAGEN, Denmark – Despite bad summer weather and an equally poor autumn, bike sales in Denmark continued on an upward trend in 2007. Luckily the spring was perfect which gave sales a firm boost during the first half of the year. As in many markets, the influence of the weather on bike sales in Denmark remains tremendous; even in a market where the bicycle is used for transportation on a large scale and not only for sports and recreation. *The import figures from the Danish Statistical Bureau are incorrect. Danske Cykelhandlere approx. figures. In Bike Europe’s 2006 report on the Danish bike market, this trade journal already pointed to the similarities between Denmark and Holland. In particular to emphasize the impact that bike usage has on bike sales. In Denmark as well as in Holland bikes are commonly used, in particular for shopping trips, taking the kids to school, commuting or touring the countryside. The striking fact is that in 2006 as well as in 2007 bike sales in both countries grew almost equally. Is that coincidence? Or does it show that widespread bike use in a country results in a yearly sales increase of about 6%? 2007 was the second year that the Danish bike market broke the half million unit mark for domestic consumption (indicating the number of bikes delivered to the distribution channels). With the total number somewhat above the 550,000 units, one could even optimistically say that it is now growing towards its next milestone: the 600,000 mark. With a total population of about 5.5 million Danes that would be a record breaking number for the whole world and is an indication that the Danes like the Dutch are bike crazy. Maybe it’s better to state that people from the two countries really understand the benefits of bike usage and that the most Europeans still have to discover them. According to Erik Oddershede, director of the Danish association for bike dealers ‘Danske Cykelhandlere’, 554,300 bikes were sold last year; up about 30,000 and 5.7% compared to the 2006 total. As in other years the official figure, from the Danish Statistical Bureau, presents a much higher number for total sales. It claims a total of over 700,000 new bikes were sold last year. According to Erik Oddershede that figure is incorrect due to incorrect import figures. Rather than 650,000 bikes being imported in 2007 in Denmark, the true figure is more like 490,000. Previous years’ statistics made clear that each time the Danish Statistical Bureau presents overly high import figures. It is also unclear what this official figure is based on. 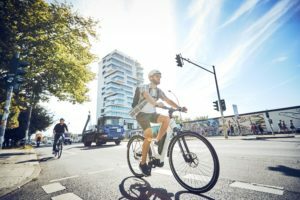 The figures for bike imports into Denmark from Eurostat (the EU data bureau that gets its numbers from custom documents) indicate that the Danish Statistical Bureau figures are each time about 70,000 units off the mark. These Eurostat statistics also show a yearly re-export figure for bikes of about 70,000 units. Subtracting the two figures from the total import figure brings the total bike import to the figure that is estimated by the Danish bike trade. 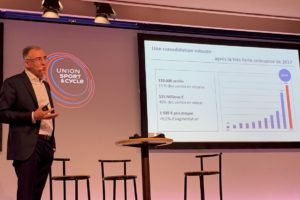 How are e-Bikes doing in Denmark? Are they as popular as nowadays in Holland? According to Danske Cykelhandlere sales more or less started in 2007. And it was a slow start. However, that changed at the beginning of 2008. Erik Oddershede reports on a huge interest from consumers and press. 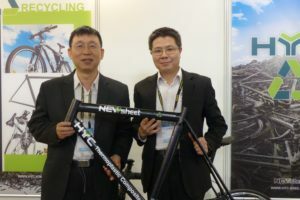 “Also the suppliers saw the possibilities and started to have nice looking e-Bikes in their ranges. I expect the sales of e-Bikes in 2008 to be around 8,000 units, but expect it to be much higher in 2009. 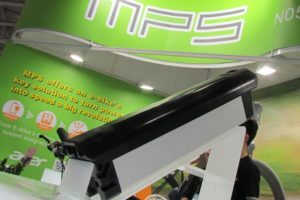 I am not sure that we can reach the tremendous sales numbers of the Netherlands,” claims the Danish dealer association director. That sales of such bikes are expected to grow in 2009 also have to do with a wide offering not only at dealers but also at supermarkets like the Bilka chain. 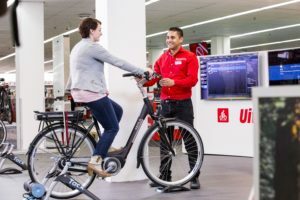 Bilka offers e-Bikes under the SCO brand name in its 15 stores. These are City bikes with fenders, luggage carrier and lighting system sold for DKK 6,999 (€ 940). So, how successful the about 450 Danish bike dealers are with their e-Bike sales, is not yet quite clear. What is certain is the fact that dealers in Denmark are doing OK. They are year after year (but only in small steps) getting a tighter grip on their market. Currently Danske Cykelhandlere estimates the IBDs market share to stand at somewhat over 60%. Switching to bike production in Denmark; that dropped significantly in 2006: by over 20% to about 115,000 units. That drop wasn’t recovered in 2007. On the contrary, bike production again decreased; this time by 6.7% to 106,000 units. The only big bike maker in Denmark is Kildemoes Cykelfabrik A/S; a subsidiary of Cycleurope AB. Annual production of this bike maker stands at about 115,000 units. The decrease in bike production is related to the big drop in exports shown in the 2006 and 2007 figures for the Danish bike market.